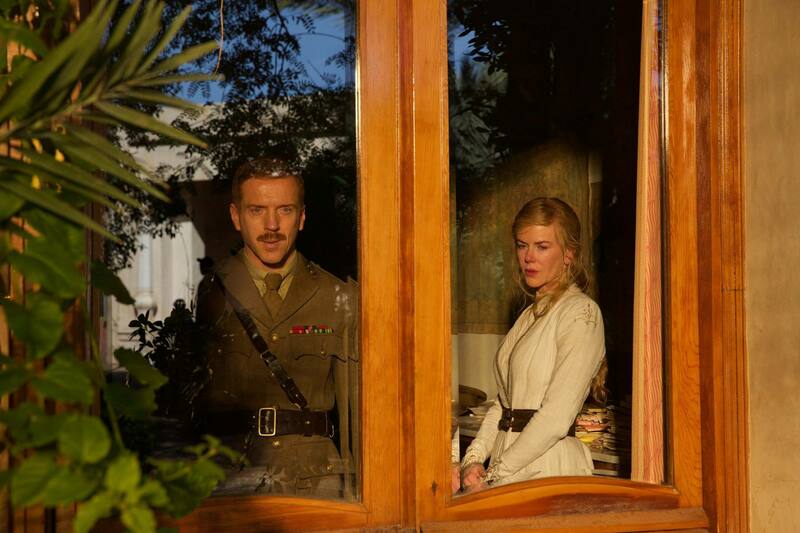 Truth be told, Queen of the Desert has had, at best, mixed reviews everywhere it’s been screened. All signs point to the film being a rather conventionally shot story of West meets East. The muted palette with which it’s filmed lends it the feeling of a world seen through a thin layer of dust. Yet while we feel the heat rise off the sand, it seems we’re also at a cold remove from the characters. Perhaps this is one of the biggest critiques of the film: that the layers of dust don’t really let us into the character’s hearts. 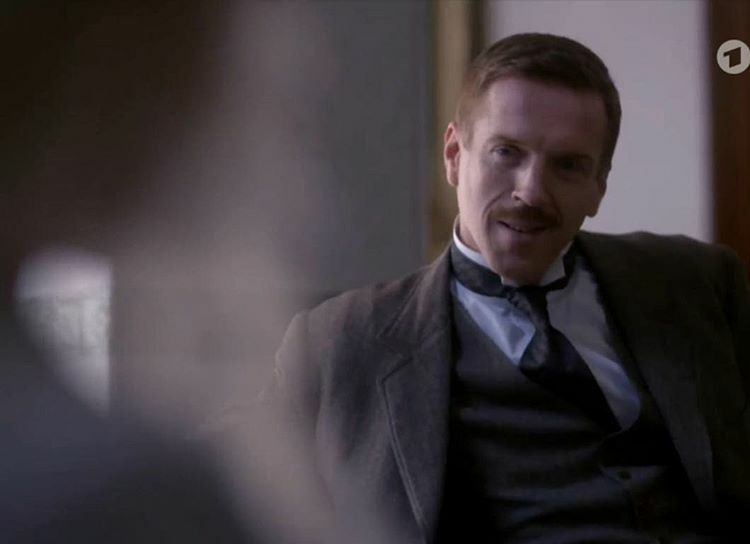 For his part, Damian Lewis in the part of Charles Doughty-Wylie (Richard) certainly does try to convey the contents of his heart in his scenes with Nicole Kidman as Gertrude Bell. In Richard and Gertrude, we see a relationship between two equals who have expressed passionate feelings for each other, at least on paper, but, for a multitude of reasons (or perhaps for no reason at all?) never get together. They are both driven independent people who are attracted to each other but somehow are never on the same page even in the times when they are together. It’s not love lost, or love constantly strained and put up against impossible obstacles, it’s more simply an attraction that in all its fire, somehow stalls. We’ve seen a clip of Gertrude and Richard at a stable: Richard is painting a white lollipop shape on a black horse. Obviously he’s trying to disguise the horse for some nefarious purpose, either to sell it to someone or otherwise pawn it off as something it isn’t. He doesn’t hide what he’s doing from Gertrude, but, in fact, seems to take great pride in it. Without even knowing the exact circumstances, I can venture that he’s pulling a scam. And the fact that he’s taking such pride in it shows him to be that brand of colonist, who like present-day corporate moguls, will do whatever it takes to get ahead of a bottom line. Where colonists inked secret deals for land that wasn’t theirs and painted horses to make them appear what they weren’t, so present-day corporations ink deals over lives and resources they care little for and disguise it all under the coat of paint of creative accounting. Anyway, as we know from the biography of Gertrude Bell, she wasn’t as gung-ho on the colonial agenda as her peers, so it’s interesting to dissect what she makes of all this. We see Gertrude’s face change at the end of the interchange at the stable, but I’m not sure why. She may be taken aback by his charm, his confidence in telling the story of why he’s painting a horse, his cleverness over whatever scam he just pulled. Conversely, she may be taken aback that this man she’s drawn to is so comfortable pulling scams. We know they were equally attracted to each other, but we also know that Gertrude safely guarded all the letters he wrote to her whereas he promptly destroyed all she wrote to him. Sure, he had a wife and therefore had more to lose were he to be discovered, but, still, the very act of destroying their correspondence says something about the kind of man he was. I’ve called him a rogue, before. And this clip of his propensity towards wickedness in horse trading certainly confirms it, no? Also, what we know about Damian Lewis is that he’s never played anyone all good or all bad. Much like the white stripe/blaze painted on a black horse, Damian Lewis never plays one color. Moreover, in whatever roles he takes, he’s bound to leave you guessing: is it a white stripe on a black horse or black paint nearly covering an otherwise white horse? In another of the film clips, Richard and Gertrude are at a souk, where they take a break from shopping to chat about the state of their relationship, or lack thereof. Gertrude tells Richard she’s not ready to go any further in their affair. Then Richard tells Gertrude he longs for her. They both seem frustrated and they both seem at odds in expressing their frustration to each other. It’s not a simple case of one doing all the desiring and all the chasing, while the other plays coy. Knowing what I know of their letters to each others as well as what I feel from this scene, the attraction is mutual and they both equally want things to progress. But, what I do sense from this scene is while they may want the same thing, they seem to want it for different reasons. In an interview clip shown on Danish TV, Damian Lewis does a spot on impression of Werner Herzog’s description of this film. So Herzog is the donkey, but who are the camel, elephant and bison? Because a single woman in the Victorian age going on adventures alone was such an anomaly, there are a slew of men around Gertrude at every turn, some amused by her gumption, bewildered by her, and some trying to stop her and tell her in no uncertain terms what’s done and what’s not done in Victorian society. What comes through the strongest from all the trailers is Gertrude’s independent spirit. Its that spirit that seems to draw men to her as well. So while there are men bent on subduing her wild spirit, there are others who fall in love with that same spirit and proceed to flutter around her like moths. Two of the most ardent men in Gertrude’s orbit were Henry Cadogan (James Franco) and Charles Doughty-Wylie (aka Richard). We don’t know which of these “ships” Herzog will be paying the most homage. The trailer seems to focus slightly more on Henry, but, suffice it to say, the biography devoted an entire chapter to Richard while Henry got a scant few pages. In the few scenes we see of him in one of the theatrical trailers, Richard comes off as desirous and impatient to have the object of his desire. He seems to be a practical sort who doesn’t want to dwell on the impossibility of their situation (ie him being married), and just wants to get on with the business of having a relationship with this fiery woman. He wants her, he’s impatient with her. The body language in the trailer and in the various stills we’ve seen (particularly the still at the farm) show him widening himself trying to embrace her, encompass her, despite the obstacles in their way. The letters between them show no indication that he feels his accomplishments small in comparison to hers, so my read of this stance is that Richard wants Gertrude to see him, to notice him and respond. He seems to follow her movements, flighty and impulsive as they may be, to be close to her. He senses her walking behind him and turns quickly to see her, a movement which again communicates his enthrallment of her. In another scene clipped in the trailer, we see Gertrude in conference with a gentleman in uniform. When she’s had enough of this condescending fool trying to stand in her way, she rises suddenly from their conversation. The shot widens and we see Richard as an onlooker on this scene, listening, perhaps even taking sides with the guy trying to talk her out of a dangerous mission. But when she rises, he rushes to rise too, and walk away from the conversation, showing her that despite his better judgement, he wishes to stand by her. He’s perplexed by her, drawn to her, and eager to please her, in the hopes that eventually, he may have her. When they finally are able to be alone together, it seems a quiet moment of intimacy eventually ending in tears. Whether or not Herzog will have Damian saying any of his Richard’s own written words (perhaps in a voice over as Richard writes them to Gertrude) remains to be seen. But, tell me, how sweet it is to imagine Damian Lewis’ velvet-soaked-in-cabernet voice delivering such words? I have often loved women as a man like me does love them, well and badly, little and much, as the blood took me, or the time or the invitation, or simply for the adventure –to see what happened. But that is all behind me. Where are you? It’s like writing to an idea, a dream..Is it that gloom that is so black tonight? Or is it the regret for things lost, great and splendid things I find in your book, your mind and body, and the dear love of you, all lost…Would you like me to write you a love letter — to say how glad and gratified and humble I am when I think of you. ..desert has you, you and your splendid courage, my queen of the desert — and my heart is with you. If I was young and free, and a very perfect knight, it would be more fitting to take and kiss you. But I am old and tired and full of a hundred faults…you are right — not that way for you and me– because we are slaves, not because it is not the right, the natural way– when the passions of the body flame and melt into the passions of spirit—in those dream ecstasies so rarely found by any human creature, those, as you say, whom God hath really joined– in some divine moment we might reach it—the ecstasy. We never shall. But there is left so much. As you say my dear, wise Queen — all that there is we will take. In one of his interviews, Damian Lewis confessed to imagining the characters he’s given to play as animals. I imagine the process gives him a feeling for their basic animal elements, the skeleton of emotional space from which he can then build the complex humans he portrays. 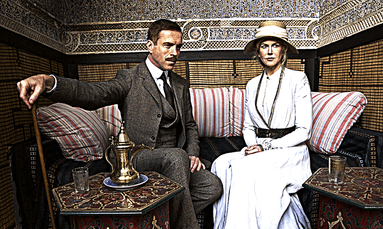 So let’s imagine Queen of the Desert with Damian Lewis as the elephant to Nicole Kidman’s camel. And let the dusty desert sketches of Herzog’s vision entice us to seek this film out when it is finally released. Previous Previous post: Damian Lewis LOVES Singing Show Tunes!